What are conditions in Azure Active Directory conditional access? You can control how users access your cloud apps by using Azure Active Directory (Azure AD) conditional access. In a conditional access policy, you define the response ("Then do this") to the reason for triggering your policy ("When this happens"). In the context of conditional access, When this happens is called a condition. Then do this is called an access control. The combination of your conditions and your access controls represents a conditional access policy. Conditions you haven't configured in a conditional access policy aren't applied. Some conditions are mandatory to apply a conditional access policy to an environment. This article is an overview of the conditions and how they're used in a conditional access policy. The users and groups condition is mandatory in a conditional access policy. In your policy, you can either select All users or select specific users and groups. When you select All users, your policy is applied to all users in the directory, including guest users. All guest users targets a policy to B2B guest users. This condition matches any user account that has the userType attribute set to guest. Use this setting when a policy needs to be applied as soon as the account is created in an invite flow in Azure AD. Directory roles targets a policy based on a user’s role assignment. This condition supports directory roles like Global administrator or Password administrator. Users and groups targets specific sets of users. For example, you can select a group that contains all members of the HR department when an HR app is selected as the cloud app. A group can be any type of group in Azure AD, including dynamic or assigned security and distribution groups. You can also exclude specific users or groups from a policy. One common use case is service accounts if your policy enforces multifactor authentication (MFA). Targeting specific sets of users is useful for the deployment of a new policy. In a new policy, you should target only an initial set of users to validate the policy behavior. A cloud app is a website or service. Websites protected by the Azure AD Application Proxy are also cloud apps. For a detailed description of supported cloud apps, see cloud apps assignments. The cloud apps condition is mandatory in a conditional access policy. 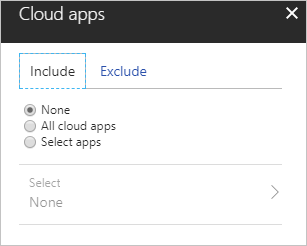 In your policy, you can either select All cloud apps or select specific apps. All cloud apps to baseline policies to apply to the entire organization. Use this selection for policies that require multifactor authentication when sign-in risk is detected for any cloud app. A policy applied to All cloud apps applies to access to all websites and services. This setting isn't limited to the cloud apps that appear on the Select apps list. Select apps to target specific services by your policy. For example, you can require users to have a compliant device to access SharePoint Online. This policy is also applied to other services when they access SharePoint content. An example is Microsoft Teams. 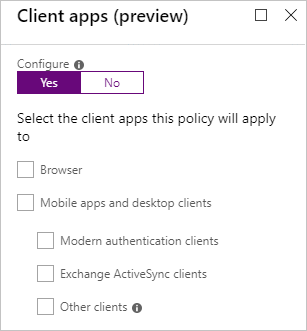 You can exclude specific apps from a policy. However, these apps are still subject to the policies applied to the services they access. A sign-in risk is an indicator of the likelihood (high, medium, or low) that a sign-in wasn't made by the legitimate owner of a user account. Azure AD calculates the sign-in risk level during a user's sign-in. 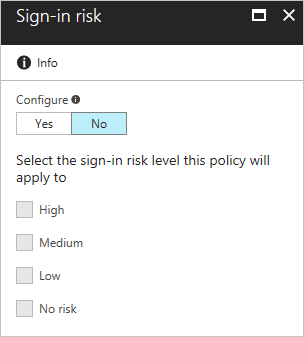 You can use the calculated sign-in risk level as condition in a conditional access policy. To use this condition, you need to have Azure Active Directory Identity Protection enabled. Block users with a high sign-in risk. This protection prevents potentially non-legitimate users from accessing your cloud apps. Require multifactor authentication for users with a medium sign-in risk. By enforcing multifactor authentication, you can provide additional confidence that the sign-in is done by the legitimate owner of an account. For more information, see block access when a session risk is detected. The device platform is characterized by the operating system that runs on your device. Azure AD identifies the platform by using information provided by the device, such as user agent. This information is unverified. We recommend that all platforms have a policy applied to them. The policy should either block access, require compliance with Microsoft Intune policies, or require the device be domain joined. The default is to apply a policy to all device platforms. 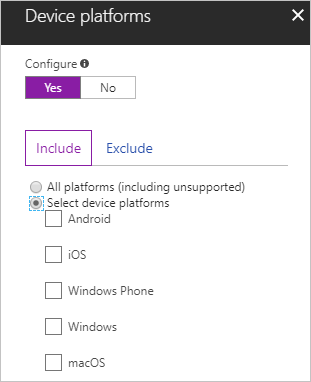 For a list of the supported device platforms, see device platform condition. A common use case for this condition is a policy that restricts access to your cloud apps to managed devices. For more scenarios including the device platform condition, see Azure Active Directory app-based conditional access. 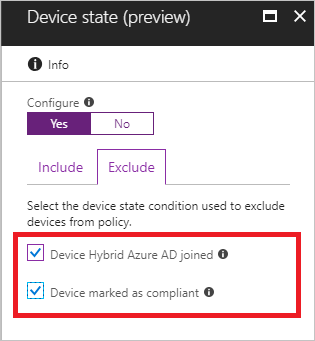 The device state condition excludes hybrid Azure AD joined devices and devices marked as compliant from a conditional access policy. This condition is useful when a policy should apply only to an unmanaged device to provide additional session security. For example, only enforce the Microsoft Cloud App Security session control when a device is unmanaged. By using locations, you can define conditions based on where a connection was attempted. Require multifactor authentication for users accessing a service when they're off the corporate network. 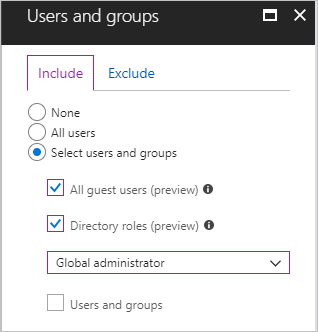 Block access for users accessing a service from specific countries or regions. 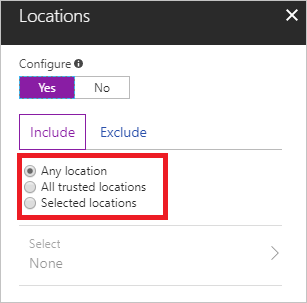 For more information, see What is the location condition in Azure Active Directory conditional access?. Browser apps - Browser apps include websites using the SAML, WS-Federation, or OpenID Connect web SSO protocols. This also applies to any website or web service that has been registered as an OAuth confidential client. For example, the Office 365 SharePoint website. Mobile and desktop apps using modern authentication - These apps include the Office desktop apps and phone apps. 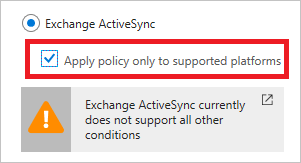 Exchange ActiveSync clients - When a policy blocks using Exchange ActiveSync, affected users get a single quarantine email with information on why they are blocked. If necessary, the email includes instructions for enrolling their device with Intune. Other clients - These apps include clients that use basic authentication with mail protocols like IMAP, MAPI, POP, SMTP, and older Office apps that don't use modern authentication. For more information, see How modern authentication works for Office 2013 and Office 2016 client apps. Require a managed device for mobile and desktop applications that download data to a device. At the same time, allow browser access from any device. This scenario prevents saving and syncing documents to an unmanaged device. With this method, you can reduce the probability for data loss if the device is lost or stolen. Require a managed device for apps using ActiveSync to access Exchange Online. Block access from web applications but allow access from mobile and desktop applications. 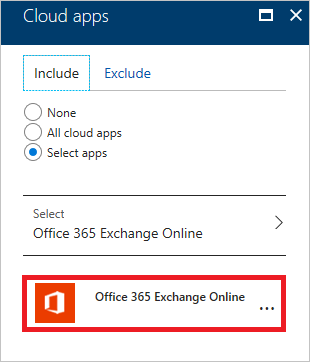 Microsoft Office 365 Exchange Online is the only cloud app you've selected. You don't have other conditions configured in a policy. However, you can narrow down the scope of this condition to apply only to supported platforms. When access is blocked because a managed device is required, the affected users get a single mail that guides them to use Intune. If an approved app is required, the affected users get guidelines to install and use the Outlook mobile client. In other cases, for example, if MFA is required, the affected users are blocked, because clients using Basic authentication don't support MFA. You can only target this setting to users and groups. It doesn’t support guests or roles. If a guest or role condition is configured, all users are blocked because conditional access can't determine if the policy should apply to the user or not. Set up SharePoint Online and Exchange Online for Azure Active Directory conditional access. Azure Active Directory app-based conditional access. To find out how to configure a conditional access policy, see Quickstart: Require MFA for specific apps with Azure Active Directory conditional access. To configure conditional access policies for your environment, see the Best practices for conditional access in Azure Active Directory.